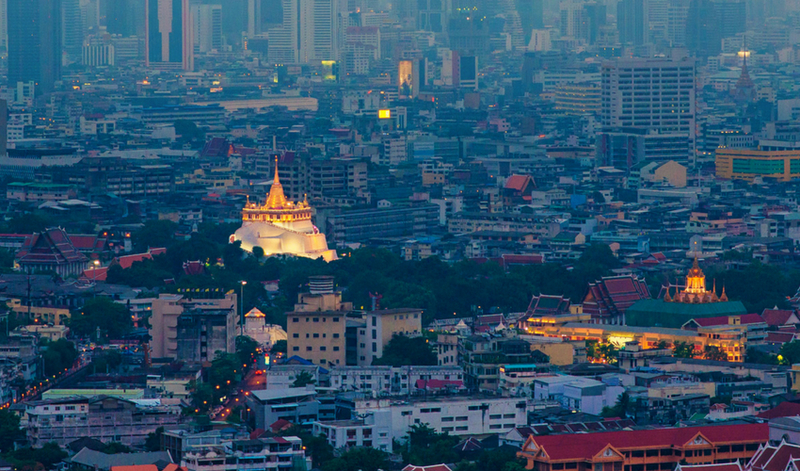 Home to over eight million people, Bangkok is Thailand's capital and its largest and most dynamic city. Today's modern Bangkok is a thriving place with a booming economy and plenty of economic opportunity. It's also a city with a long rooted history that is very much part of the contemporary Thai culture and people. People have been living in this part of the world for thousands of years. Lovely Bangkok is host to many leisure travellers as well as those here on business. One of the many regional sites on any traveller's list are the city's many beautiful, historic temples. Roughly four hundred dot the landscape in the city, making them a must-do for any traveller who wants to see all the city has to offer and for a small fee, you'll find lovely interiors, monuments to local culture and a chance to see some of the most important sites in the entire area. There are hundreds of beautiful temples in Bangkok which can be daunting when you only spending a couple of days is this fabulous city, so we whittled the list down to just ten temples which we feel encompass the beauty of the city and its temples. Please remember to be respectful, this means that men must wear long pants and short-sleeved or long-sleeved shirts (no tank tops or sleeveless shirts). Women must wear skirts or pants extending at least to the knee, and also should not wear a top that reveals bare shoulders. Dating back to the seventeenth century, Wat Saket is a fascinating temple but one with a macabre past. It's actually built on the site of a massive burial and cremation area. Once inside, you'll be greeted with scenes of scary Buddhist hell all over the walls. This is the place to get a close up look at the regional belief system and see what locals are thinking about. If you're here in November, be sure to see the temple fair. There's a candlelit pilgrimage that lights up the night that is open to all those who want to watch. It's open every day of the year so it's easy to head here no matter when you're visiting. A small fee gives you access to the entire temple and stunning views across the magnificent city. Open: every day from 9am until 7pm. Admission Price: the temple (Wat Saket) is free - Admission to the top of the mountain is 50 Thai Baht. One of the most recognisable of all local temples, Wat Suthat is a temple with history. There's a large red lacquered structure that looms over the entire structure giving it the name Temple of the Giant Swing. This Rattanakosin style temple is one of the oldest of such temples in the country. Behind the exterior, you'll find a temple compound with soaring walls that seem to stretch for miles. Intricate murals are glorious works of art decorated in beautiful colours that show off the local style. There's a huge statue of Buddha made of bronze in the Sukhothai style. This royal temple is one of ten top grade such temples in the city. Open: open daily from 9 am until 6 pm. Admission Price: 20 Thai Baht. A local landmark, Wat Phra Kaew is a vast complex with much to see from every corner. Many people call it the Temple of the Emerald Buddha. The complex is one of the nation's largest and most popular tourist destinations so make sure you know how to get there and what you plan to see before you leave. There's a 94.5-hectare spread to explore so allow plenty of time to see it all. You'll want to see at least a significant fraction of the region's over one hundred buildings on foot. Your first stop should be the Emerald Buddha and buildings that have served as housing for royalty for many centuries. It's made of carved jade. In addition, there's also exhibitions that illustrate the history of the entire region and help you understand the government of Thailand over the centuries. This is the temple considered the single most holy temple in all of Bangkok and in Thailand so expect lots of crowds and other tourists as well as locals. It's a good idea to hire a guide for a small fee to help you navigate once you get inside as it can be confusing to get around. Don't miss the beautiful Vimanmek Teak Mansion that invites you to see life as it was among the nation's elite for many decades. If you have time for only one temple, this one is it. Open: open daily from 8:30 am to 3:30 pm. Admission Price: 500 Thai Baht. Located on the west bank of the Khlong Bangkok Noi canal, Wat Suwannaram has been restored to its former glory and now gleams from every angle. The interior is decorated with renowned murals by ,modern artist Thongyu. His use of vivid colour and depiction of local scenes make this temple particularly attractive for those who love art and appreciate the use of local materials. You can see Thai artwork in a natural setting that's specifically designed to show it off. There's a gold leaf Buddha inside that is a very popular section and beautiful craftsmanship. The area is a very tranquil river community and also worth exploring. Open: open daily from 8 am to 5 pm. Part of the one of the oldest temple complexes in the city, the Temple of the Reclining Buddha dates from about two hundred and fifty years ago. Since undergoing an extensive renovation about thirty years ago, it's again become one of the most popular sites in the city. Once inside, the star of the show is the huge reclining Buddha. This one is forty-six meters long. It's also an awe inspiring fifteen meters high from base to top. It's part of the Viharn Phranorn temple complex that's spread out over eighty-thousand meters. Make sure you allow enough time to see the complex as well as this temple. One hundred and eight painted murals line the rest of temple. There's a hundred and eight metal bowls right here as well. One hundred and eight is a significant number for Thais as it is the symbolic of the actions and that helped lead the Buddha to a life of true perfection. Drop a coin in one for luck and respect for local traditions. This one is a quick ten minute walk from the Grand Palace so it's easy to include the temple as part of a larger tour of the area. The temple makes a cool retreat on a hot day. Admission Price: 100 Thai Bhat. Also known as the Temple of Dawn, Wat Arun is one of the most photographed sites in Thailand. To get here, catch a boat from the Sapphan Taksin boat pier. Look for Pier Eight as you travel. Guides on board can help you find it as you enjoy the boat ride. There's a shuttle boat that will bring you directly to this complex. While it's a lovely site any time of the year, coming here early in the morning before the crowds hit means you'll have much of the complex to yourself and a chance to take stunning selfies. Look at the spire on the main temple. It rises about seventy meters from the water and it's made of gleaming coloured glass and highly detailed Chinese porcelain tiles. The steps are very steep so make sure you wear shoes with enough support. Consider a private tour to learn all about the temple's storied history from someone who has studied it in depth. Allow at least an hour to fully explore the temple's interior and admire the view from the shore. This is the place to see the rest of the city and take the time to appreciate it. Open: open daily from 8:30 am to 5:30 pm. Another easy temple to get to from the Grand Palace, Wat Mahathat is site that attracts people in search of the regional culture. They'll find it here as it is location of the regional Mahachulalongkorn Buddhist University and meditation center. This is the place to learn more about the practices of Buddhism and meditation. Many holy relics line the walls of the temple, making it a place of pilgrimage for residents across Thailand. Visitors can participate by taking one of many meditation classes here in order to master this ancient art. They are given in English, making it easy to follow instructions. Take the time to visit the amulet market across the street. Vendors sell authentic products that are believed to help you do everything from fall in love to ward off any evil spirits who may be following you around. Open: open daily from 9 am to 5 pm. Wat Benjamabophit is also known as the Marble Temple. That's because the temple walls are made from imported Italian marble. This makes it stand out from the rest of the region quite vividly. It's a major tourist attraction so be prepared to allow enough time to cope with crowds. You'll be glad you did. This is classic Bangkok style. The elaborate finials are coupled with high gables and a stepped roof line. Admire the complex carved details and the gold leaf that makes this shine from a distance and close up. This is a relatively modern temple with a history that dates back from just about the turn of the last century. This a great place to be during the Buddhist festival of Magha Puja in February or during the May Visakha Puja. Catch the evening twilight candle lit procession as locals flock here to worship at night. There's a cloister that has an assembly hall with fifty-two statues of Buddha. Open: open daily from 8 am to 5:30 pm. Admission Price: 20 Thai Bhat. If you're heading to Bangkok's Chinatown, this temple is right next door. This temple is largely famous for the large golden Buddha it houses inside. Take a taxi or use the MRT Subway and then get off at the Hualamphong station. The temple is a short distance away. Keep in mind there are lots of staircases here so shoes with good support are crucial. This is the largest golden statue of the Buddha anywhere in the world. Once you're done admiring it, you can visit the site's museum to learn more about the history of the region and the statue itself. Admission Price: 10 Thai Bhat to visit museum. This unique structure is an easy reach from the heart of the Old City. It's located on the beautiful grounds of Wat Ratchanatdaram. There's five distinct towers that are decorated with thirty-seven metal spires. These spires are said to represent the thirty-seven virtues that are necessary for those who wish to achieve the path to enlightenment in Buddhism. This is a good choice if you wish to avoid crowds as it is one of the less popular but equally lovely regional temples. The Loha Prasat, which means iron castle or iron monastery, has 37 black metal spires symbolising the 37 virtues that are required to reach enlightenment. It consists of 3 levels, the bottom has 24 spires, the middle has 12 spires and the top level has 1 spire, totalling 37 spires. Open: open daily from 8:30 am to 6 pm. Our concierges at our Thonglor Hotel and Sukhumvit Hotel can provide directions and touring arrangements for you whilst exploring Bangkok.